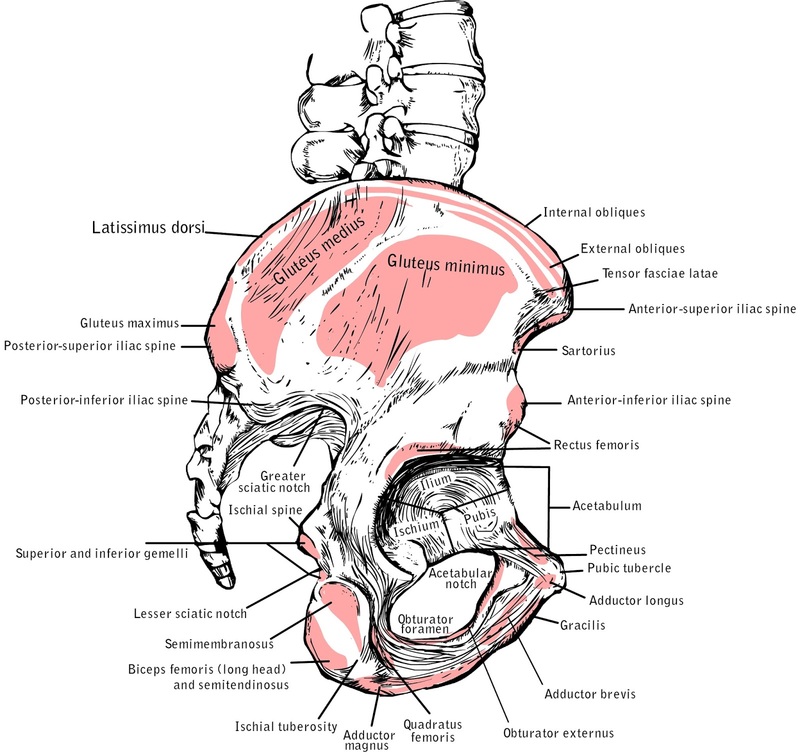 The subspine (anterior inferior iliac spine, AIIS) is located below the two bones on each side of your pelvis, commonly called the hip bones (although that is not an accurate description). Those bones that stick out and you can feel, approximately at your pant pockets, are the ASIS (anterior superior iliac spines). The AIIS is located below those bones you can feel but lies deeper under the soft tissues because the ilium slopes. See the images below. The EntrepreneurialPatient: A Patient’s Guide to Hip Impingement also contains a chapter on hip anatomy that explains terminology and concepts of motion among other things. CT scan of left hip showing the ASIS. 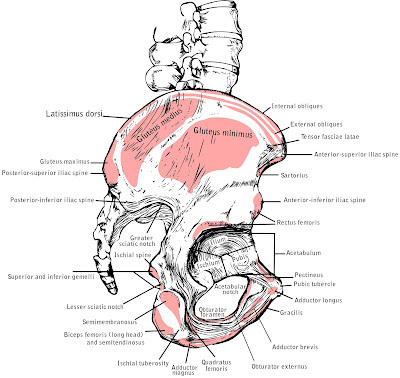 Pelvis seen from the side. The AIIS is located just above the hip socket (on the right side of the image). 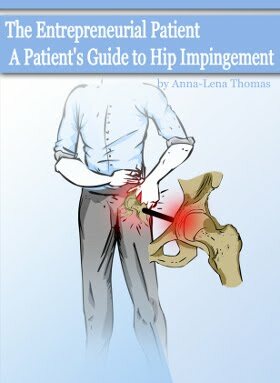 Image is from The Entrepreneurial Patient: A Patient's Guide to Hip Impingement. A smooth ilium wall without bony prominences between the lower (caudal) level of the AIIS and the rim of the hip socket. Bony prominences on the ilium wall extending from the lower (caudad) areas of the AIIS to the rim of the hip socket, or, alternatively, the AIIS sits just at the level of the rim of the hip socket and appears as a “roof-like” prominence over the hip. The AIIS extends to below the rim of the hip socket and has a downward “spur appearance”. Seventeen percent of patients were found to have a type I AIIS shape; 73% of patients were found to have a type II AIIS shape; 10% were found to have a type III AIIS shape. 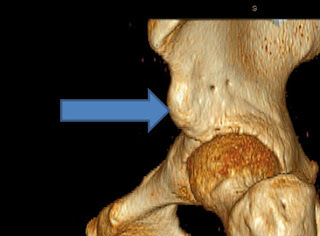 The researchers also identified three views on 3-D reconstruction CTs that provided excellent visualization of the shape of the AIIS (in addition to the anterior-posterior, AP, view). Upon defining the types of AIIS shapes, the researchers used a 3-D CT-based dynamic software simulation program to measure and compare the end range of (terminal) hip flexion and the end range of internal rotation. This blogger notes that measuring range of motion using simulation software takes the soft tissue restrictions (such as adductor and rectus femoris tone/tightness) out of the equation. The simulation software allows for visualizing the movements of the ball (femoral head) in the socket. However, the study authors noted, that soft tissue impingement on the labrum was not part of the study since CT scans do not show soft tissue. The average terminal values for hip flexion were 120°, 107° and 93° for type I, type II and type III respectively. The average terminal values for hip internal rotation at 90° flexion were limited to 21°, 11° and 8° for type I, type II and type III respectively. The analysis with the dynamic simulation software then revealed that in terminal flexion there were different areas of impingement. For type I AIIS shapes, the simulation showed that there was never any involvement of the AIIS. In those cases, the impingement only occurred between the rim of the hip socket and the front of the femoral neck. In hips with type II AIIS shapes, the simulation showed that, in some cases, there was impingement between the area of the lower extension of the AIIS and the femoral neck. In other type II cases there was impingement against the upper-front of the rim of the hip socket due to overcoverage (see my blog post Diagnosing Pain Generators throughout the Hip Using the Layer Concept for explanation of overcoverage). Finally, the study validated its computer simulated findings by CT scanning a cadaver in positions that are commonly used as impingement tests (A Patient’s Guide to Hip Impingement contains a thorough explanation of those pain tests. The researchers compared the results from cadaver CT scan and the subsequent computer simulations to the CT scans and computer simulations performed with patient images. This study was the first to classify the types of AIIS impingement in a way that other doctors can reproduce when they evaluate patients for hip impingement. The study authors concluded that the study supports the rationale for considering shaving down the AIIS for shape types that extend to and below the rim of the hip socket (types II and III). The authors also cautioned that although the study showed a relative prevalence of AIIS type II among the study participants, that finding may not accurately represent prevalence in patients with hip impingement. The sample sizes were too small to draw that kind of conclusion. That makes sense to me. If that were the case and approximately 73% of all patients treated for CAM and pincer deformities also had a type II AIIS shape, there would probably not be as many good outcomes as I think there are. Of course, it is also possible that a type II AIIS shape does not always contribute to actual impingement (how a person moves in reality) or symptomatic pain. One would need larger studies, and studies performed not by retrospectively viewing CT scans (as in the case of the referenced study), but by following patients from diagnosis through treatment and follow-ups to be able to draw such a conclusion. From a patient perspective, you need to be aware that assessing your hips and pelvis by means of CT scan does expose you to some radiation. The study referenced above stated that it reduced the radiation from between 6.2- 8.2 Rad for traditional CT scans to 1.6 Rad. Neither does every imaging center offer that kind of CT equipment nor does every doctor or radiologist have access to advanced computer simulation software. If AIIS impingement is a concern, you should be aware of the radiation you will be exposed to as well as know what kind of reading you will get from your images. A 3-D reconstruction is not the same as 3-D computer motion simulation software. If you and your doctor feel that the motion simulation software is needed, you may have to send your imaging to someone who has that technology and of course correlate the findings to your symptoms. You may have to pay for that reading, but it could be well worth it to leave no stones unturned. The AIIS can be decompressed using arthroscopic equipment or during open surgery depending on the extent of the deformity and impingement. Since not all surgeons are used to performing this procedure, patients need to make sure the surgeon does have the necessary know-how to decompress the AIIS should it be needed (2). Stay tuned for more “hippy” posts! 1) Anterior Inferior Iliac Spine Morphology Correlates With Hip Range of Motion: A Classification System and Dynamic Model. Iftach Hetsroni MD, Lazaros poultsides MD, Asheesh Bedi MD, Christopher M. Larson MD, Bryan T. Kelly MD. Clin Orthop Relat Res (2013) 471:2497-2503. DOI 10.1007/s119999-013-2847-4. 2) Making a Case for Anterior Inferior Iliac Spine/Subspine Hip Impingement: Three Representative Case Reports and Proposed Concept. Christopher M. Larson, MD, Bryan T Kelly MD and Rebecca Stone MS ATC. Arthroscopy: The Journal of Arthroscopic and Related Surgery. Vol 27, No 12 (December), 2011: pp 1732-1737. Great info, this really helps me understand my diagnosis better, as I'm told that my aiis is a problem, and was not decompressed by my first surgeon. If only they would do research of this kinda with femoral neck and trochanter impingemnt , which I guess is related. I'd surely like to read this new paper and see the images. 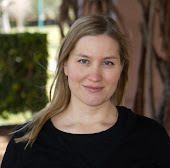 More great research and writing Anna-Lena!You do much for the community.